Day three of the meet is too early to begin worrying about empty seats. But if the attendance was 18,425 as reported July 22, they counted obese people twice. 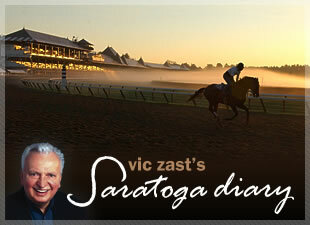 Old-timers and locals, who remember when Saratoga went 24 days─Mondays through Saturdays for four weeks─pine for a shorter meet. About 30 days of racing sounds right. That won’t happen as long as the powers to be continue to think of immediate profits instead of long term health for the sport. The 98th running of the grade II Sanford Stakes headlined the program. Jack Wolf, the major domo of Starlight Stables, predicted victory for his morning line favorite, Rose Junction. At a party on Saturday evening, he said, “I don’t usually say that we’ll win. But I think this time we will.” Bashirt did him in. Rosie Napravnik, who rode Bern Identity, would not be denied. She and the wonderfully-named, bay son of Bernstein came home ahead of the pack comfortably. Ramon Dominguez outdid Napravnik by guiding six horses to victory on the day. He swept the early Daily Double and won three more races before capping the finale with Wet One, an Irish-bred 5-year-old mare that followed the pace for most of the trip before splitting horses in deep stretch to triumph. Back after rehab, Kent Desormeaux, aboard a 10-1 longshot named Sheerflakesofgold, finished second. Desormeaux is listed on one horse on Monday. Hardrocker, ridden by Jose Lezcano, defeated Dominguez aboard the even-money Current Design in the fifth or else he might have had seven. But the applause that Hardrocker received for finishing first was nothing in comparison to the ovation the horse that ran last got. At 96-1, Richard Metivier’s Uragano finished several furlongs behind the rest and heard whoops and hollers that should have woke the first-time starter up from his stupor. They did not. 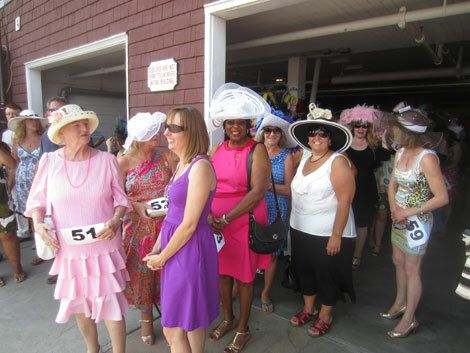 Julie Potter of Duanesburg, N.Y. won the Hat’s Off to Saratoga hat competition. There were 78 contestants. Except for the playing of the National Anthem, the sound system worked. People sat when they should have stood. 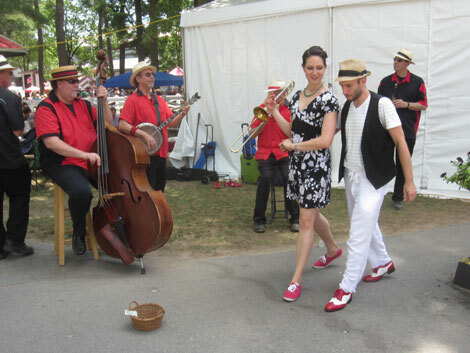 In the backyard, Emily Vanston and Nathan Bugh, two swing dancers from Brooklyn, N.Y., fronted a bucket for tips, as Reggie’s Red Hot Feetwarmers provided the tunes. Swing dancers performing for tips in the Saratoga backyard. First of 78 hat contest contestants line up to show off their fashion sense.